Home/ATD News/ATD’s President Vic Van Slyke met with several representatives of major hog producers of China to introduce ATD’s manure management system. 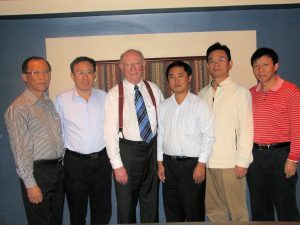 On Sept. 27, 2010 ATD’s President Vic Van Slyke met with several representatives of major hog producers of China to introduce ATD’s manure management system. From left to right:Liew We Lim, Executive Director, China Division of PigPro, Wang Jianxin, Van Slyke, Liao Bo, Chen Zhonghua and Luo Xianglin .